Embryonal tumors of the central nervous system (CNS) include a heterogeneous group of immature-appearing neoplasms that are highly cellular and mitotically active, thus having a superficial resemblance to the developing nervous system. These highly malignant tumors most often arise in children and not only invade nervous tissue but also can disseminate in the cerebrospinal fluid (CSF) and subarachnoid space. This article addresses atypical teratoid/rhabdoid tumor (AT/RT) and some uncommon types of CNS primitive neuroectodermal tumors (PNETs). The most common CNS embryonal tumor is medulloblastoma, which is discussed in a separate article. The histologic spectrum of AT/RT overlaps significantly with other forms of CNS neoplasia, including PNETs, germ cell tumors, sarcomas, and choroid plexus carcinomas. It is important that AT/RT be distinguished from other CNS embryonal tumors because of the relatively poor prognosis of AT/RT and because of the need for accurate stratification of patients for therapeutic protocols. The term "malignant rhabdoid tumor" was first used in reference to rare pediatric renal tumors that contained tumor cells with vesicular nuclei, prominent nucleoli, and cytoplasmic inclusion-like structures composed of whorls of intermediate filaments. Neoplasms with such rhabdoid features have subsequently been identified in other locations, including the CNS. This section will cover CNS PNETs; the rare embryonal tumors CNS medulloepithelioma and ependymoblastoma are briefly discussed elsewhere (see the Prognosis and Predictive Factors section). The term "central nervous system primitive neuroectodermal tumor" (CNS PNET) refers to noncerebellar PNETs that may arise in the cerebral hemispheres, brainstem, or spinal cord and are composed of immature neuroepithelial cells that may express neuronal and glial antigens. All CNS PNETs are World Health Organization (WHO) grade IV by definition. Tumors showing only neuronal lineage have been referred to as cerebral neuroblastoma or cerebral ganglioneuroblastoma, depending on the degree of apparent maturity of the neuronal elements. An embryonal tumor with abundant neuropil and true rosettes has been described (see the image below). 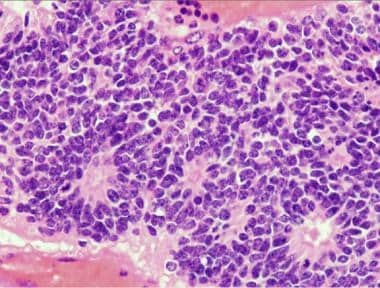 It is not yet clear whether this highly aggressive neoplasm should be considered a variant of supratentorial PNET (sPNET) or a unique tumor entity. A variant of primitive neuroectodermal tumor (PNET) with abundant neuropil and true rosettes. It should be noted that CNS PNETs are biologically and clinically distinct from the peripheral PNET (pPNET)/extraosseous Ewing sarcoma group of non-CNS tumors. Go to Primitive Neuroectodermal Tumors of the Central Nervous System for complete information on this topic. The pathophysiology and etiology of atypical teratoid/rhabdoid tumors (AT/RTs) and central nervous system (CNS) primitive neuroectodermal tumors (PNETs) are briefly reviewed in this section. Loss of heterozygosity and mutation of the retained allele of a putative tumor suppressor gene INI1(hSNF5/SMARCB1) located on chromosome 22q11.2 is the defining molecular characteristic of AT/RT. INI1 protein normally functions in chromatin remodeling, and its loss is associated with several other pediatric renal and soft-tissue tumors as well as with CNS AT/RT. AT/RT may arise in either supratentorial or infratentorial locations. The cerebral hemispheres are the preferred site above the tentorium, with occasional cases arising in the pineal region or, rarely, as suprasellar lesions. The cerebellum is the most common location in the infratentorial compartment where the hemispheres are most commonly involved. In this location, medulloblastoma will be a part of the differential diagnosis. Such tumors may also be found in the cerebellopontine angle, brainstem, and, rarely, in the spinal cord. AT/RTs may involve multiple nervous system sites at presentation; dissemination along cerebrospinal fluid (CSF) pathways is identified in more than 20% of patients at the time of presentation. A few high-throughput genomic analyses also suggest that there are significant molecular genetic differences between these 2 tumor types, but clearly more work is needed in this area. The vast majority of CNS PNETs arise in the cerebral hemispheres, but rare cases have been reported in the brainstem, spinal cord, or suprasellar area. Most patients with AT/RT are younger than 3 years, and these tumors account for 1%-2% of pediatric brain tumors. A male predominance varying from 3:2 to 2:1 has been reported. As noted (see the Pathophysiology and Etiology sections), rhabdoid tumor predisposition syndrome (with constitutional loss or inactivation of the INI1 gene) may occur, but it is rare. CNS primitive neuroectodermal tumors (PNETs) represent about 1%-3% of CNS pediatric neuroepithelial tumors, and there is a slight male predominance. Patients are generally children or young adults, although rare cases may be encountered in adults. The clinical and imaging features of atypical teratoid/rhabdoid tumors (AT/RTs) and central nervous system (CNS) primitive neuroectodermal tumors (PNETs) are briefly reviewed in this section. Signs and symptoms of AT/RTs depend on patient age, tumor location, and obstructive effects and may include lethargy, vomiting, and failure to thrive. Headaches and hemiplegia tend to be more common in children older than 3 years. Children with posterior fossa tumors may develop head tilt and/or cranial nerve palsies. Imaging studies of AT/RTs usually reveal an aggressive-appearing lesion that enhances with contrast administration and shows restricted diffusion (see the image below). The latter feature is also a characteristic of other CNS embryonal brain tumors, especially the medulloblastoma when the cerebellum is involved. These tumors may contain areas of apparent necrosis or cystic change. Nodular leptomeningeal dissemination will be present in around one fifth of patients. (A): Axial T1 postcontrast computed tomography (CT) image of a hemispheric atypical teratoid/rhabdoid tumor (AT/RT) shows partially cystic, contrast-enhancing hemispheric mass with midline shift and enlarged ventricles. 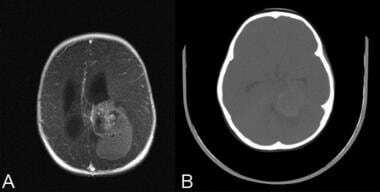 (B): CT scan shows a cerebellopontine (CP) angle tumor in an 18-month-old child. AT/RT should be considered in the differential diagnosis of CP angle tumors in young children less than 2 years of age. Focal signs and symptoms of CNS PNETs are related to the location in which the tumor arises; generalized effects due to mass and increased intracranial pressure may also occur. Seizures are not uncommon, and, in infants, there may be an increase in head circumference before closure of the cranial sutures. The tumors are usually large and contrast-enhancing and may contain areas of calcification (see the image below). Axial (A) turbo spin-echo magnetic resonance image (MRI) and (B) computed tomography (CT) scan show a contrast-enhancing thalamic mass with a predominantly solid component and calcification. 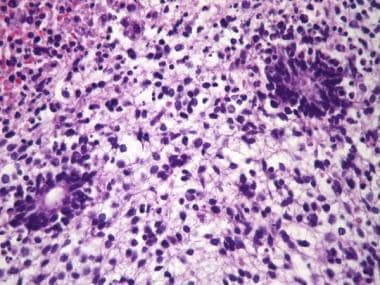 The differential diagnosis is specific to atypical teratoid/rhabdoid tumors (AT/RTs), central nervous system (CNS) primitive neuroectodermal tumors (PNETs), and ependymoblastomas. The aforementioned histologic variability displayed by AT/RTs creates significant overlap with the appearances of other embryonal tumors (see the section on Microscopic Findings). 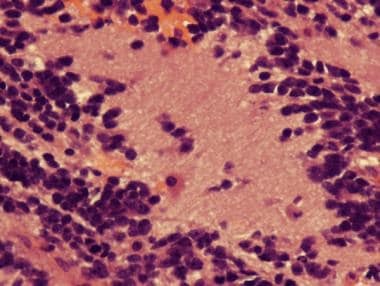 The differential diagnosis of CNS PNETs includes small cell variants of astrocytic gliomas, including glioblastomas and highly cellular ependymomas (ependymomas are discussed in a separate article). However, pseudopalisading necrosis and vascular endothelial proliferation that are associated with glioblastoma are not typical of CNS PNETs, though they occur in rare instances. Predominantly astrocytic features occasionally emerge after therapy in tumors that originally showed typical features of CNS PNET. 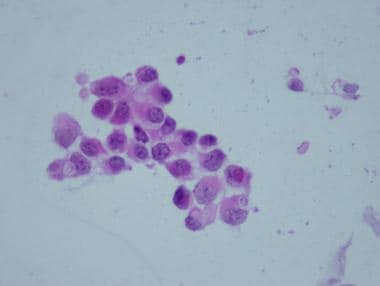 Virtually any highly cellular, small blue cell process could enter the differential diagnosis if one considers a wide patient age group; thus, lymphoma, metastatic small cell carcinoma, or even a meningeal sarcoma should be excluded. With extensive neuronal differentiation, ganglioglioma and central neurocytoma could be considered in the differential diagnosis. However, these neoplasms present a much more differentiated neuronal phenotype, as well as distinct tendencies to arise in rather characteristic locations: the temporal lobe for ganglioglioma and the interventricular septum for central neurocytoma. CNS medulloepithelioma is a rare, enigmatic, malignant embryonal tumor that shares many features with (and may represent a subtype of) CNS PNET. The defining histopathologic feature of CNS medulloepithelioma is an immature tubular, trabecular, or sometimes papillary arrangement of neuroepithelial cells that resembles the appearance of the embryonic neural tube (see the image below). Such tumors have also been reported in the eye and, rarely, peripheral nerves. 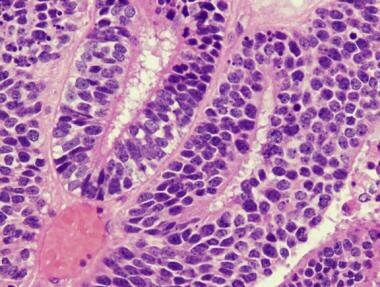 The primitive neural tube is recapitulated in medulloepithelioma and immature teratomas. Its presence with the internal and external limiting membranes should be distinguished from the ependymoblastomatous rosettes of ependymoblastomas, which lack an external limiting membrane. Medulloepitheliomas arise in children younger than 5 years. Although the cerebral hemispheres are most commonly involved, examples arising in the brainstem have been reported. Such tumors are typically well-circumscribed, may contain cysts, and may be calcified. The solid tumor appears gray-tan and may contain areas of hemorrhage or necrosis. In addition to the characteristic neural tube-like formations and areas of nonspecific PNET-like histology, this tumor may contain a range of neoplastic cells that appear to be differentiating along neuronal, astrocytic, oligodendroglial, and ependymal lines. Mitoses occurring at apparent luminal aspects of tubular structures are reminiscent of the developing neural tube. Occasional examples may contain mesenchymal elements such as cartilage, bone, or immature skeletal muscle and even melanin pigment has been described. Mesenchymal differentiation may be seen in teratomas and medulloepithelioma but does not distinguish between these 2 types of embryonal tumors. In infants and very young children, the immature teratoma should be considered in the differential diagnosis. The latter tumor typically contains extensive immature neuroepithelial features, including neural tube-like elements. A careful search for immature epithelial and mesenchymal elements can be helpful in the diagnosis of immature teratoma, especially in fetuses and neonates with congenital CNS tumors. The prognosis for CNS medulloepithelioma has been poor, with local recurrences and occasionally CSF dissemination. Ependymoblastomatous rosettes showing a multilayered cellularity without an external limiting membrane. Such rosettes often have a central lumen lined by the apical regions of tumor cells that contain basal bodies of cilia (blepharoplasts). As with other CNS embryonal tumors, the prognosis is poor, and CSF dissemination may occur. The gross features of atypical teratoid/rhabdoid tumors (AT/RTs) and central nervous system (CNS) primitive neuroectodermal tumors (PNETs) are briefly reviewed in this section. AT/RTs are similar to other CNS PNETs in their gross appearance, typically being soft, fleshy, and pink-gray with necrosis or hemorrhage. There may be evidence of multifocality as well as leptomeningeal spread. The authors have observed cases in which the tumor spread in a striking manner through the spinal foramina to involve the pleura extensively. CNS PNETs are rather soft, gray-tan tumors with solid and sometimes necrotic-appearing areas. These masses may have a deceptively circumscribed border with adjacent brain tissue. Although the rhabdoid cell is considered to be a unifying histologic feature of AT/RTs, several microscopic features significantly overlap with those of other embryonal tumors. [1, 3] Rhabdoid cells have vesicular nuclei that contain prominent nucleoli and, in the classic case, have an eosinophilic inclusion–like cytoplasm that is composed of intermediate filament whorls (see the images below). 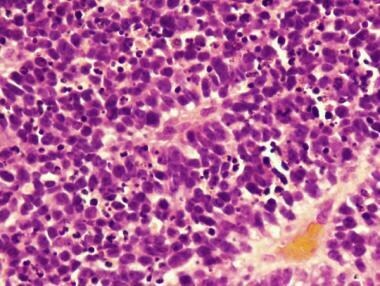 Cluster of tumor cells from an atypical teratoid/rhabdoid tumor (AT/RT) shows eccentric vesicular nuclei with distinct nucleoli and surrounding eosinophilic cytoplasm; this intraoperative finding should raise the differential diagnosis of AT/RT. Histologic section of tumor in preceding figure shows classic rhabdoid morphology with eosinophilic globular cytoplasmic inclusion. Typical rhabdoid elements are usually combined with a variety of other morphologies, including so-called small blue cell types (see the image below). Primitive neuroectodermal tumors (PNET)-like area may be a component of an atypical teratoid/rhabdoid tumor (AT/RT). Note how the small blue cell cytology contrasts with that of the characteristic rhabdoid cell in the preceding figure. 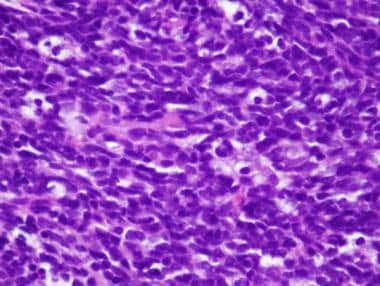 The tumor cells may also appear pale, show cytoplasmic vacuolation, or present a spindle cell or fascicular growth pattern (see the image below). Moreover, the tumor cells may be arranged in cords or trabeculae that are embedded within a myxoid extracellular matrix. (A): Regional cytoplasmic vacuolation (top) and more typical rhabdoid cells (bottom) may be seen in atypical teratoid/rhabdoid tumor (AT/RT). Prominent cytoplasmic vacuolation should raise the differential diagnosis of AT/RT when seen in a stereotactic biopsy that may not show classic rhabdoid cells. (B): Regional mesenchymal and spindle cell component may also be seen. CNS PNETs are composed of small to medium-sized cells with scanty perinuclear cytoplasm and hyperchromatic nuclei (see the image below). 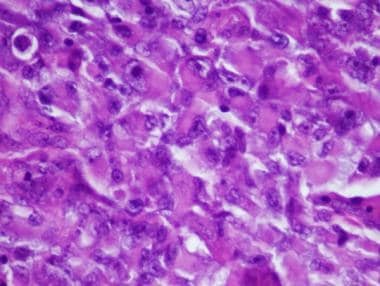 Undifferentiated blue cells in a primitive neuroectodermal tumor (PNET) with marked cellular anaplasia, frequent apoptosis, and mitosis. Focal or regional neuronal/neuropil differentiation may be seen (see the image below). Mitoses are abundant, and necrosis of individual tumor cells may be identified. Areas of glial differentiation may have more of a spindle cell appearance. Rosettes of the Homer Wright type are rare. Stromal neuropil differentiation in a differentiating primitive neuroectodermal tumor (PNET). PNETs that occur in the pineal gland (pineoblastomas) may also show Flexner-Wintersteiner (retinoblastomatous) rosettes. An occasional CNS PNET expressing neuronal lineage on presentation has been observed to show more glial or glioma-like phenotype upon recurrence. The relationship between these types of neoplasms and small cell tumors of the glioma group remains uncertain. 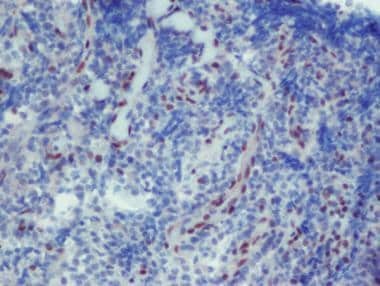 Immunohistochemical features are specific to atypical teratoid/rhabdoid tumors (AT/RTs) and central nervous system (CNS) primitive neuroectodermal tumors (PNETs). AT/RTs show variable multilineage antigen expression by immunohistochemistry (IHC). Most tumors are reactive for epithelial membrane antigen (EMA) (see the first image below), vimentin (see the second image below), and smooth muscle actin (although desmin is usually negative) while being negative for germ cell markers. Strong and diffuse epithelial membrane antigen (EMA) positivity is a frequent feature of atypical teratoid/rhabdoid tumor (AT/RT). (A): Vimentin positivity tends to be diffuse, whereas (B) smooth muscle actin expression can range from focal (as seen here) to regional or diffuse. Regional immunopositivity for glial fibrillary acidic protein (GFAP) or synaptophysin (in the presence of a PNET component) may be seen. The defining AT/RT deletion of the INI1/hSNF5 gene correlates with a loss of INI1 protein immunoreactivity, [3, 15] in contrast with most other forms of CNS neoplasia, which show strong nuclear immunoreactivity for INI1 (see the image below). Loss of INI1 protein nuclear expression is a diagnostic hallmark of atypical teratoid/rhabdoid tumor (AT/RT). Note lack of expression by tumor cells and positivity in endothelial cells that serve as internal control. Fluorescence in situ hybridization (FISH) may be useful diagnostically in some cases (see the image below). 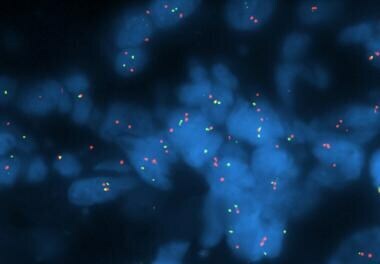 Fluorescence in situ hybridization (FISH) for INI1/hNSF5 gene showing a test (green) to reference (red) probe ratio of less than 0.8, consistent with loss of heterozygosity for the INI1 gene. The retained allele is usually mutated, with resulting loss of protein expression. Total loss of both alleles may also occur. At least focal neuronal lineage will usually be revealed by IHC. Thus, reactivity for synaptophysin, neurofilament proteins, neuron-specific enolase, and class III beta-tubulin may be seen (although gliomas may also be reactive for the latter 2 proteins). Glial elements of sPNET are immunoreactive for GFAP. As would be expected, the Ki-67 (MIB-1) labeling index is very high in sPNETs. CNS PNETs should be strongly immunoreactive for INI1 protein and thereby readily distinguishable from AT/RT, which is negative for this antigen. The occasional finding of dense core vesicles by electron microscopy supports the neuronal lineage of this tumor. The prognosis of atypical teratoid/rhabdoid tumors (AT/RTs) and central nervous system (CNS) primitive neuroectodermal tumors (PNETs) are specific to these tumors. The underlying molecular genetic differences between CNS PNETs and medulloblastomas probably underlie the differences in prognosis and survival between these two neoplasms. CNS PNETs have an overall poor survival (20%-30% at 5 years) when compared with the 50%-70% 5-year survival rate for medulloblastomas. Hope for improved outcomes in young patients with CNS PNET has been provided by some recent protocols using myeloablative chemotherapy followed by hematopoietic stem cell rescue. Radiation therapy is typically reserved for older children, but its utility in younger children is currently being evaluated. Yachnis AT, Perry A. Embryonal (primitive) neoplasms of the central nervous system. in: Perry A, Brat DJ, eds. Practical Surgical Neuropathology: A Diagnostic Approach. Philadelphia, PA: Churchill Livingstone; 2009. 163-76. Nakata S, Nobusawa S, Hirose T, et al. Sellar atypical teratoid/rhabdoid tumor (AT/RT): a clinicopathologically and genetically distinct variant of AT/RT. Am J Surg Pathol. 2017 Jul. 41 (7):932-40. [Medline]. Judkins AR, Eberhart CG, Wesseling P. Atypical teratoid/rhabdoid tumor. In: Louis DN, Ohgaki H, Wiestler OD, Cavenee WK, eds. WHO Classification of Tumors of the Central Nervous System. Lyon, France: International Agency for Research on Cancer (IARC); 2007. 147-9. Krishnan C, Vogel H, Perry A. Atypical teratoid/rhabdoid tumor with ganglioglioma-like differentiation: case report and review of the literature. Hum Pathol. 2014 Jan. 45 (1):185-8. [Medline]. Satomi K, Morishita Y, Murata Y, Shiba-Ishii A, Sugano M, Noguchi M. Epidermal growth factor receptor abnormalities in atypical teratoid/rhabdoid tumors and an unusual case with gene amplification. Pathol Res Pract. 2013 Aug. 209 (8):521-6. [Medline]. Warmuth-Metz M, Bison B, Gerber NU, Pietsch T, Hasselblatt M, Fruhwald MC. Bone involvement in atypical teratoid/rhabdoid tumors of the CNS. AJNR Am J Neuroradiol. 2013 Oct. 34 (10):2039-42. [Medline]. Shim KW, Xi G, Farnell BM, Kim DS, Tsurubuchi T, Tomita T, et al. Epigenetic modification after inhibition of IGF-1R signaling in human central nervous system atypical teratoid rhabdoid tumor (AT/RT). Childs Nerv Syst. 2013 Aug. 29 (8):1245-51. [Medline]. McLendon RE, Judkins AR, Eberhart CG. Central nervous system primitive neuroectodermal tumors. In: Louis DN, Ohgaki H, Wiestler OD, Cavenee WK, eds. WHO Classification of Tumors of the Central Nervous System. Lyon, France: International Agency for Research on Cancer (IARC); 2007. 141-6. Roberts CW, Orkin SH. The SWI/SNF complex--chromatin and cancer. Nat Rev Cancer. 2004 Feb. 4 (2):133-42. [Medline]. Wesseling P, Beigel JA, Eberhart CG, Judkins AR. Rhabdoid tumor predisposition syndrome. In: Louis DN, Ohgaki H, Wiestler OD, Cavenee WK, eds. WHO Classification of Tumors of the Central Nervous System. Lyon, France: International Agency for Research on Cancer (IARC); 2007. 234-5. Schneppenheim R, Fruhwald MC, Gesk S, et al. Germline nonsense mutation and somatic inactivation of SMARCA4/BRG1 in a family with rhabdoid tumor predisposition syndrome. Am J Hum Genet. 2010 Feb 12. 86 (2):279-84. [Medline]. [Full Text]. Hungate EA, Applebaum MA, Skol AD, et al. Evaluation of genetic predisposition for MYCN-amplified neuroblastoma. J Natl Cancer Inst. 2017 Oct 1. 109 (10):[Medline]. Udaka YT, Packer RJ. Pediatric brain tumors. Neurol Clin. 2018 Aug. 36 (3):533-56. [Medline]. Giangaspero F. Medulloepithelioma. In: McLendon RE, Rosenblum MK, Bigner DD, eds. Russell and Rubinstein’s Pathology of Tumors of the Nervous System. 7th ed. New York, NY: Oxford University Press; 2006. 287-90. Judkins AR. 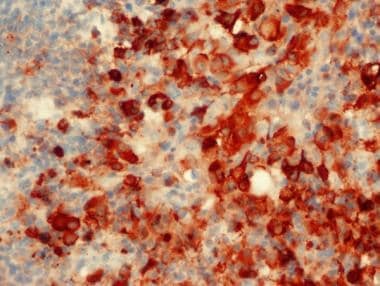 Immunohistochemistry of INI1 expression: a new tool for old challenges in CNS and soft tissue pathology. Adv Anat Pathol. 2007 Sep. 14 (5):335-9. [Medline]. Ginn KF, Gajjar A. Atypical teratoid rhabdoid tumor: current therapy and future directions. Front Oncol. 2012. 2:114. [Medline]. [Full Text]. Zaky W, Dhall G, Ji L, et al. Intensive induction chemotherapy followed by myeloablative chemotherapy with autologous hematopoietic progenitor cell rescue for young children newly-diagnosed with central nervous system atypical teratoid/rhabdoid tumors: the Head Start III experience. Pediatr Blood Cancer. 2014 Jan. 61 (1):95-101. [Medline]. Patibandla MR, Ridder T, Dorris K, et al. 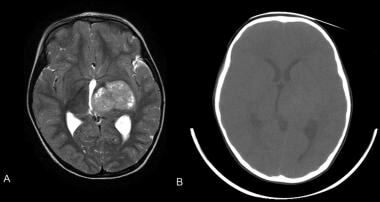 Atypical pediatric ganglioglioma is common and associated with a less favorable clinical course. J Neurosurg Pediatr. 2016 Jan. 17 (1):41-8. [Medline]. Archer TC, Sengupta S, Pomeroy SL. Brain cancer genomics and epigenomics. Handb Clin Neurol. 2018. 148:785-97. [Medline]. Stem Cell Therapies for Alzheimer's Disease: Is It Time?